Fall leaves show their true colors. All of the colors that we see are in the leaf’s year around. Some colors are simply more dominant than others and cover up the non- primary colors. As the production of chlorophyll declines, the leaves true colors surface. Leaves are basically 5 colors. Green Chlorophyll makes leaves green. This substance is the color of the food the tree needs. The sun shining on the leaf surface generates the plant energy. As the weather cools, and days become shorter, less chlorophyll is generated, and the trees turn to stored sugars to survive the winter. RED Anthocyanin is the next substance that gives leaves color. As the chlorophyll is broken down, Anthocyanin is produced. Maples, oaks and sumacs have this red pigment. Orange Carotene is the next abundant pigment. Sassafras and sugar maples are full of this color. This is the same pigment that gives carrots their colors. 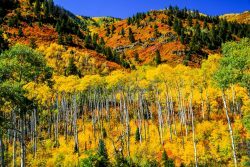 Yellow Xanthophyll is a common color found in ashes, aspens, some oaks, and beeches. These pigments are also common in squashes. Brown The leaves are dead, and the brown color is all that is left. Moisture eventually leaves the leaves and the leaves become the nutrient for the trees. As the leaves rot, they nourish the tree for next year’s colorful foliage. Now is the time to take a drive and enjoy the colors of fall. 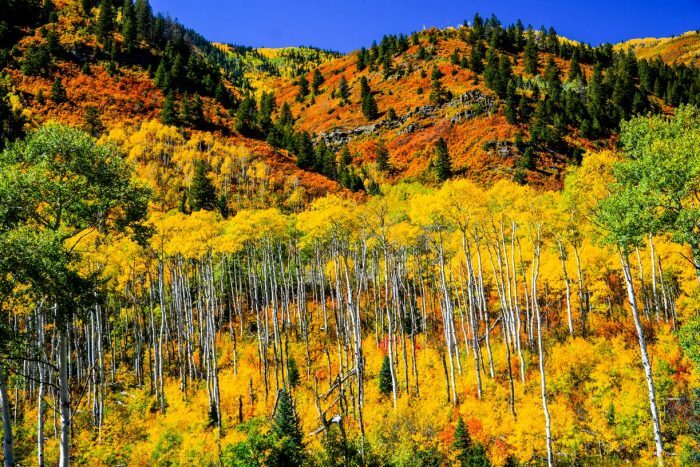 Try high line mountain roads to see the maples and aspens. Watershed drives will display many other colors. Find a scenic viewing area to see an entire panorama of colors. Winter white will take over soon!